2 Phono plugs. 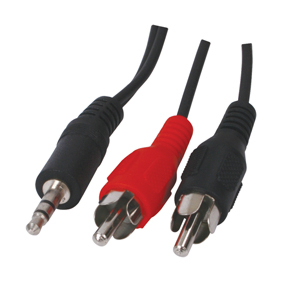 (RCA) to a 3.5mm Stereo Jackplug. Typically used for: Phono to MP3, Phono to Ipod, Phono to PC, Phono to portable device, Portable device to Home HiFi etc etc etc. 20M Long screened cable.